Lake Kittamaqundi Multiuse Trail — BayLand Consultants & Designers, Inc.
BayLand was selected to provide the Columbia Association a feasibility study to complete the multiuse trail loop around Lake Kittamaqundi and to provide the subsequent engineering, permitting, bidding and construction services for the selected trail alignment. The initial study to determine the practicability of constructing fixed improvements on the newly constructed peninsulas of Lake Kittamaqundi included a pedestrian bridge, boardwalk, trails, approaches and appurtenances necessary for the completion of the hiker/biker loop around the northern portion of the lake. The feasibility study examined the characteristics and design considerations of the site including orientation, soils and foundation conditions, community design considerations, constructability of proposed features, permit requirements, costs and maintenance of improvements. BayLand also conducted a supplemental investigation for the multiuse trail, analyzing three different alignments and compared efficiency, practicability and expenses, while taking into consideration community concerns and environmental impacts. Benefits included providing enhanced access to natural areas along the eastern shoreline, vistas and a full panoramic view of the lake, and necessary access for emergencies and maintenance. BayLand presented the study and alternatives analysis to the Columbia Association Board of Directors and the community where the recommended alignment was selected to complete the trail loop around Lake Kittamaqundi. The design elements of the selected multiuse trail alignment included paved trails, a timber boardwalk, and associated site improvements. BayLand designed the trail and boardwalk in accordance with ADA requirements and AASHTO bicycle standards while minimizing impacts to trees and environmental resources. A geotechnical analysis was performed to determine the boardwalk pile foundation requirements and a floodplain analysis established the boardwalk deck elevation. The boardwalk railing utilized a stainless-steel cable system to complement the surrounding downtown Columbia environment. Bank stabilization was also proposed for the adjacent Little Patuxent River to prevent further erosion and protect the trail improvements. The SWM requirements for the increased impervious area were pursued through ESD credits such as sheet flow to buffer and disconnection of non-rooftop runoff. 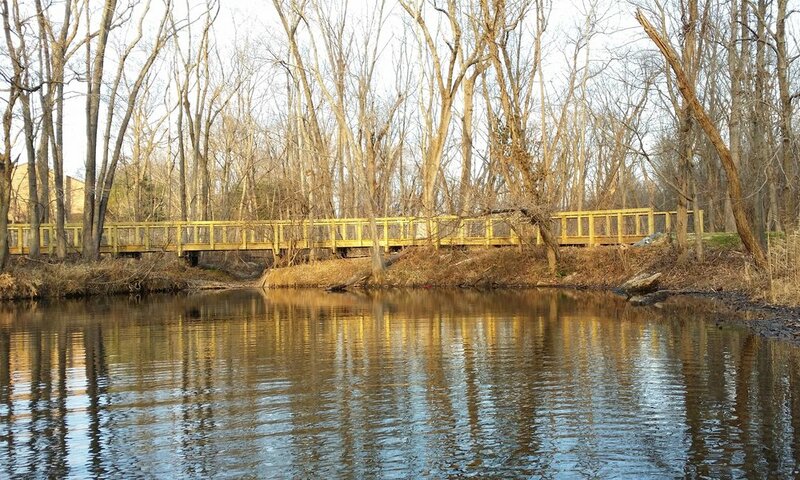 Construction drawings included existing conditions and demolition, geometric layout for the trail alignment, paving and bank stabilization details, structural details for the boardwalk, construction access details, SWM, and erosion and sediment control. Permits and approvals were required from the Maryland Department of the Environment and the U.S. Army Corps of Engineers for floodplain, wetlands and stream impacts. The project was approved by the Howard County Planning Board for site development, by the Soil Conservation District for sediment erosion control and by SHA for construction access. The project required extensive coordination between the Columbia Association, Howard Hughes Corporation, Howard County and public outreach. The project design, permitting and construction was completed on-time and on-budget.